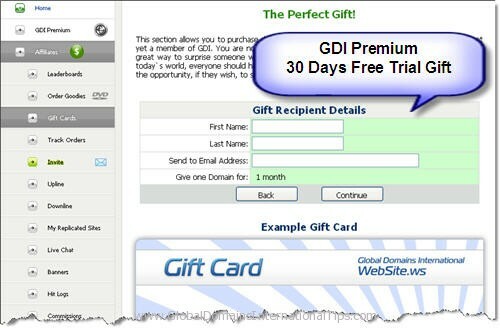 Here is a new Free way for you to promote your GDI business for the long term and receive monthly increasing residual income from Global Domains International Inc.
That’s why I have provided all my downlines with Free 25 PLR articles on MLM & network marketing for reading knowledge and most importantly to submit them to Free directories online, spread their GDI links and get Free traffic to their GDI websites. If you have signed up under one of my downlines, you would have received a password to the special guide page to read our special resource and download the articles. If you have not received them, email your upline to request for the password. You can see and contact your uplines through your GDI members area. I have successfully used Article Automation Service to submit my articles automatically to blogs but Article Automation charges a monthly fee. If you many articles to submit, then it is a worthwhile investment to build links and traffic to your websites. At the time of this post, they actually have a 30 days no question ask refund guarantee! However, I always try to find cheap and Free ways for my downlines to build their GDI business as I understand that they are new and may not have enough budget to invest on internet marketing tools for their promotion effort. Now, here’s a Free way to submit articles that can go viral online. Not many people realize this yet, but you should start submitting articles to ArticlesBase.com – article directory. This is because there is a new automatic blogging script that allows website owners to pull articles automatically from ArticlesBase article directory. When the script pulls your articles, it will be republish with your GDI links in the article and spread across the world wide web, bringing you increasing links and traffic to your GDI websites for years to come, and for FREE. This automatic blogging script has become popular and in demand as more and more website owners struggle to find good contents for their blogs, hence using this script will save them plenty of time finding suitable articles. Which means, more websites will automatically publish your article and links in their websites for many years to come. Write your own articles on GDI or re-write the ones I provided for you. Remember, you have to re-write of your articles may not get approved by the editors. Include link back to your GDI website (max 3 links) in the article content.